8 workers employed at Horizon Beverage in West Greenwich RI voted to join Teamsters Local 251 on January 6, 2016, demanding dignity and respect, fair wages and good benefits. Teamsters represent workers in the beer, liquor and wine distribution industry, and seek to raise the standards of Horizon Beverage workers to Teamster standards. Please stand with Horizon Beverage workers and Teamsters Local 251 members in calling for a fair contract. Nothing in this statement should be construed to express any intention to engage in a strike or other concerted refusal to work. More than 600 Nabisco workers in Chicago are fighting to save their community from being destroyed. Come out to hear their story and share your solidarity Thursday, Sept. 8. Mondolez (the food conglomerate based in Illinois that has Nabisco in its portfolio) announced that rather than invest $130 million in modernizing its plant in Chicago, they will instead move the jobs to a new factory in Mexico. The result: a loss of 600 well-paying and community-sustaining jobs on Chicago’s Southwest Side. Corporate Greed is threatening to sell these jobs over the border. RIH Members: Interested in CNA Training? Are you a Rhode Island Hospital member interested in CNA training? Click here to fill-out a short survey to let us know. Watch: Watch LIVE at https://facebook.com/teamsters or https://teamster.org. The internet audience will be able to submit questions that may be posed to the candidates during the Forum. Watch the Forum later, or read the transcript, at http://www.ibtvote.org. Check http://www.ibtvote.org for updates about the General President Candidates Forum. Download the official notice on the Candidates Forum from the Office of the Election Supervisor here. The Rhode Island AFL-CIO has been invited to participate in the Young Worker Leadership Institute- August 5-9 in Ohio. The RI AFL-CIO has 2 spots at this exciting conference to train and connect young union leaders from across the country. The AFL-CIO will be taking care of flights, hotels, and 2 meals a day and the Rhode Island AFL-CIO will be providing a $200 stipend for meals, taxis, and incidental expenses. Young leaders in our union who may be interested in attending can apply here. The YWLI is an advanced training that builds the labor movement by investing in young labor activists. The curriculum prepares young union members to build and help lead policy, organizing and political campaigns in their communities and through our Young Worker Advisory Council. The union-busting mayor of Fall River has issued layoff notices to 24 members. Teamsters Local 251 is fighting back at the bargaining table, at City Hall, in legal proceedings and in the streets. Driven by a political agenda, Fall River Mayor Jasiel Correia has rushed to privatize trash collection—no matter the cost to the city’s workforce or Fall River residents. The mayor’s bargaining team stormed out of contract talks in April, declared impasse, and refused to negotiate further—in violation of labor law. Next, the Mayor privatized trash collection and gave the work to EZ Disposal—against the urging of his own City Council. Local 251 has filed Unfair Labor Practice charges. Our next hearings will be held on June 8th before the Massachusetts Labor Relations Board. Community residents and the labor movement are standing with us. 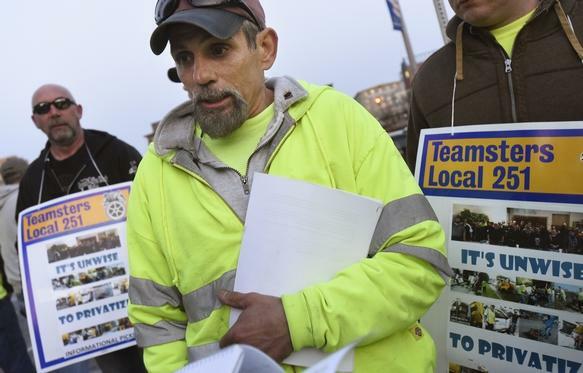 On May 10, Teamsters from Rhode Island and Boston rallied in front of City Hall. Verizon strikers joined our protest. From there union members and their families marched into the City Council meeting. The Mayor stonewalled and tried to block us from testifying—but we succeeded. The City Council passed a resolution urging the mayor to wait until the legal process is complete before laying off any workers. He refused and issued layoff notices to 24 Teamsters on June 3. The Mayor’s reckless actions put Fall River at risk of a huge liability in back pay and benefits for work lost due to privatization. Our case at the Labor Board is strong. If we win, the Mayor will have to return to the bargaining table. We are fighting to have layoffs reversed, win the work back from EZ Disposal and win full back pay and benefits for our members. While the Union is presenting our charges at the Labor Board, we have also forced the Mayor to come back to the table to bargain over the impact of his privatization plan. We have demanded that Local 251 members be guaranteed any available jobs at EZ Disposal for Fall River trash collection. In a radio interview on WSAR, the Mayor promised that our members would have the first opportunities for this work. But in negotiations on June 2, the Mayor’s spokesperson said Local 251 members are not needed to do trash disposal in Fall River. He said that CDL drivers can apply for jobs in Metro Boston instead. Mayor Correia is not the first anti-worker politician to take on the Teamsters—and he won’t be the last. But Local 251 members are united in fighting to protect good jobs and quality services in our communities. We thank workers and their families for sticking together—and thank every Local 251 member who has supported this fight. If you live in Fall River we encourage you to contact Mayor Correia and your City Councilors to support working families in Fall River, and to do the right thing for DPW workers facing layoffs. We will keep you posted. United, we win. Local 251 members voted for reforms to strengthen our union in March. Now these reforms have been officially approved by the International Union. These changes were first proposed three years ago but the officers who ran Local 251 at that time fiercely opposed the changes. A majority of members voted in favor the reforms, but the Local 251 Bylaws were not changed because a two-thirds majority was required to officially amend the bylaws. Your current Executive Board cut our salaries, launched contract campaigns, held elections for bargaining committees, started a new organizing program, and proposed the Member Bill of Rights in our local union bylaws. Members voted to approve the reforms by 90 percent. Members also voted to lower the union dues rate for all members who make less than $15 an hour and to establish a Local 251 Strike Fund to help members win good contracts. This issue is being reviewed by the International Union. We will keep you informed. Click here to download the Local 251 bylaws. Local 251 members stand united against union-busting in Fall River. We continue to bargain in good faith, but the same cannot be said for the City. Instead, the Mayor has put politics first and recklessly rushed to privatize waste removal without considering the negative impact it will have on residents, the workers who provide services to Fall River residents on a daily basis, and the financial penalties that taxpayers will pay for legal violations by the Mayor’s office during the bargaining process. We have filed charges with the Massachusetts Department of Labor Relations. A hearing is scheduled for May 23, 2016. 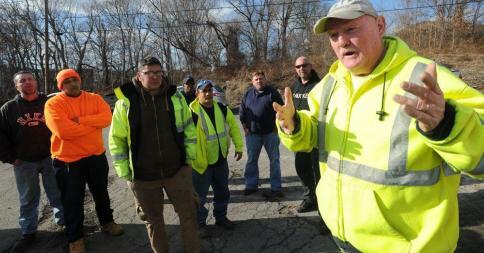 Our goal is to protect good union jobs and quality waste removal services for Fall River residents. That should be the Mayor’s goal too. We are organizing an informational picket during the next Fall River City Council meeting—Tuesday, May 10 at 5pm, Fall River City Hall. Come out and show your support, particularly Teamsters and union members in Fall River and surrounding communities. United, we win! Members voted overwhelmingly to approve reforms to our local union bylaws that build union power by empowering the membership. The changes were approved by a 90 percent vote. Members also approved a lower rate of union dues for all members who make less than $15 an hour and the establishment of a Local Union Strike Fund to help workers win good contracts. We put these reforms into effect in 2014 and they have paid off. Members have elected their shop stewards and contract negotiating committees and won strong contracts. Now, these reforms have been passed as permanent changes to the Local 251 Bylaws. The bylaws are the rules that govern our local union. Union power starts with you. Thanks to all the members who turned out to vote. Local 251 members have elected the 251 United Action Slate to represent them at the Teamster Convention this June. The 251 United Action Slate won all delegate and alternate delegate positions. You can view the official voting results here. Delegates to the Teamster Convention vote on amendments to the Teamster Constitution and nominate candidates for International Union office. A ballot for the International Union election will be mailed to every Teamster in October.